It's time for... New Year's resolutions! Stop smoking. Check. Did that in 1974. Stop drinking to excess. Check. Happily, that has never been a problem for me. My father was an alcoholic*. Nuff said. Stop driving 20 mph over the speed limit. Check. I have slowed down considerably over the past five years or so, pretty much never speed any more. 5. Knit at least one sweater for myself. Okay, those last two are gonna be a challenge, if for no other reason than that they contradict each other. At least two-thirds of my stash -- measured in yardage, not skeins -- was purchased on sale with no particular project in mind, but with the vague intention that it would be good for Dulaan and other such community knitting**. The Dulaan Project ended a couple-three years ago, pretty much right after I stocked up on 100% wool worsted weight. Edited to add: I gave Maggie brown grocery bag of yarn before they left last night, to take to her textiles teacher; the textiles classes always need yarn. Score! When I counted up what I had knit in 2009, the total was 73± items, of which about 20 were for myself, all of the actual FOs small things like socks or a hat or scarf. Enough, already, I said; time to indulge myself in some hand-knit sweaters. I started this kimono sweater in late 2007. At left, above, I had finished the front and back, joined them at the shoulders, and was preparing to pick up 275 st for the front/neck band. At right, how it looked when that was done. All it lacks are sleeves. As soon as Andrew's medical mittens are done, this is what I will be working on. As cold as it is right now, I really, really, really wish this were done. It will be lovely warm. I started this one in the summer of 2008. Most of it has been knit at least twice, for various reasons. A month or so ago I finally faced up to the fact that this bamboo yarn will almost certainly never work in this pattern. I haven't frogged it yet, but I will. I'm thinking that the drapey bamboo might work in a summer cardigan with some contrasting bits. That would be a garment that I could use. I have done some searching in Ravelry to see what others have made from the yarn. But in the meantime, into the frog pond it goes. This blue-gray DK wool has been in the stash for at least a couple years, since I bought it from Juno in her destash. A few weeks ago I was thinking hard about what I could do with it, given that I had only about two-thirds as much yarn as I would need for a sweater for myself. Then I found this pattern in Ravelry and it all came together -- a top-down raglan pullover with contrasting stripes. The contrasting yarns are Valley Yarns merino from Webs; I might add another color or two just to make the whole project more fun and also to have absolutely, positively enough yarn for the sweater to be long enough. Standard length sweaters make me look even more, er, ample than I am :( Plus, no matter how wide they are, they always look a bit too short. This last yarn, at right, is intended for a cardigan I have been plotting for, oh, about four years. I'm not gonna say more about it because that could easily jinx the project, plus those kimono sleeves and the striped raglan pullover will keep me busy for a good long while. 6. One more resolution: no purchase of yarn unless to complement existing stash for a specific project. Sock yarn counts. And those are my resolutions for 2010 knitting. Wish me luck! * Over the years it has been eye-opening to me, to say the least, how many people respond to this revelation with the fact that they have a father/uncle/brother who was/is also a problem drinker. Remind me again why liquor is legal and marijuana is not? ** My problem is two-fold: it's hard to say no to any appeal for knitted [fill in the blank], plus the items appealed for are almost always small -- hats, scarves, mittens. Small = immediate gratification, one of my weaknesses. When we got home after our two vacations I had my knitting future planned. First, I would frog the Summer Chevron up past my ill-thought mods and reknit it. With a little luck I would be able to wear it before the weather turned chilly. Once that was done, I would pick up the kimono sweater again and knit the sleeves. When the sleeves are done, the sweater will be done and ready to wear, since I already joined the fronts to the back and picked up and knit the the front and neck band. And wove in all the ends. When those two sweaters were done I would start a Clapotis using the three skeins of midnight Knit Picks Alpaca Cloud, either for myself or to have a gift in reserve. The Clap would be my carry-along knitting, and I would start swatching for a sweater that has been swimming around in my head for three years. You know what they say about the best-laid plans, right? Well, mine gang aft a-gley, too. Summer Chevron was going fine. I was powering through all that stockinette on US#4 needles when I decided maybe I should throw it on the mannequin to see how it was going to fit. Ignoring the whacked-out hemline -- which I plan to fix with some severe blocking -- it looks pretty good, doesn't it? Yeah, it's a little big. Summer Chevron went into time out. That means I can move on to the kimono sweater, right? Somehow I managed to commit myself to a smallish stealth project; another chemo cap, this one for my sister-in-law in Houston, who has a new cancer caused by the radiation treatments a few years ago for her (successfully eradicated) breast cancer; a second chemo cap for Smokey's co-worker; and some felted wine sacks to sell in a fund raiser. All nice, fun little projects and ones that I am pleased and excited to do, but all with deadlines by mid-September. Oh, and I have some Noro Silk Garden to knit a Red Scarf, too; that one at least has a later deadline. How did this happen? Dunno. I just looked at my yarn and whammo! deadlines! Here is a glimpse of part of the stealth project. The pattern stitch was a PITA for the first couple inches, but I have it down now. Happily, mistakes don't show much :-) This is a slip-stitch pattern from Barbara Walker #1. Two-color check, maybe? The book is back on the shelf now so I can't look it up easily. I hope to finish this by Monday, then on a wine sack. And the chemo caps. Ever wonder what happens if that ball of yarn attached to your current project falls out of the car and you don't notice and drive away and the yarn unwinds until it gets under the rear wheels? But the WIP that was in the knitting bag in the car was undamaged. Yay! And there was less than 5 yards left in that ball of yarn, so I didn't lose much. 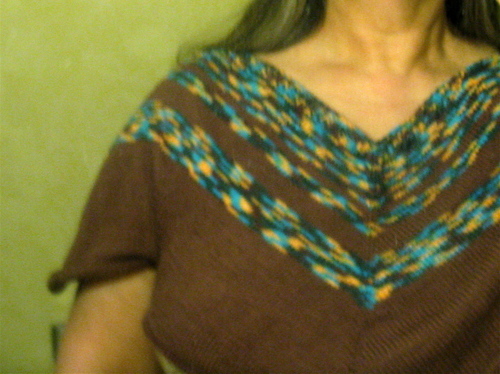 I have picked up the Summer Chevron again (that is its brown bamboo yarn above) in hopes of being able to wear it this year. It was about 80% done last summer when I realized that my pattern mods were not going to work. At all. So I set it aside until this year. I think I have figured out how to make it work, although the fit is still anybody's guess. Had to frog about half of what I had knit, all the way back to the armholes (it is knit from the top down). Stay tuned to find out whether this turns into an FO or if I end up with 17 balls of bamboo yarn in search of a pattern. Again. Meanwhile, back at the knitting. Time for a distinctly sub-par photograph of the WIP. I took this in my vintage 1970s harvest gold bathroom with inadequate light at 11 pm last night and without flash; thus, the delightful greenish cast to my skin. The color of the knitting is fairly accurate, however, and that's what we care about, right? Right. I am at the underarm, where the pattern has the knitter put the sleeve stitches on waste yarn, cast on an inch or two of additional stitches where the sleeve stitches used to be, stop knitting in the round, and commence knitting back and forth on one side, double decreasing up the side "seam" and wrap-and-turning at the end of each row so the knitting will gradually fill in the roughly triangular open area at each side. So far, it seems to fit, more or less. The real test will come in another 6" or so, when it will have encompassed the boobage. Mine is rather ample, but I am vertically challenged in the shoulder to waist area, so proper fit is often elusive. In spite of my short-waistedness, I think I want this to be longer than the pattern would have me make it. If it reaches only to my waist, there is a strong possibility that the proportions would be... so wrong as to frighten small children and dogs ugly as sin unattractive unflattering. Note: yes, that is a small sliver of bra peeking out at the lower left of the photo. Maybe this will make my blog less elementary school.